From law to social enterprise. Just a couple of months after graduating from the Master of Law and Business Program, Jason Grullón, a 25-year-old lawyer from the Dominican Republic, is working on getting his first company off the ground. His Berlin-based company VIRTŪ Shared Sense produces fair trade garments and challenges the way these types of garments are produced today. Committed to social change, VIRTŪ pays its employees three times the industry’s minimum wage and plans to invest 50% of its profits in long-term social projects. Between travelling back and forth between Santo Domingo, Berlin ,and New York, Jason found the time to answer our questions. How and when did you come up with the idea for VIRTŪ Shared Sense? "I had the idea in the back of my head of establishing a company that was profitable while providing a social good. The idea of doing something with fashion came after the Rana Plaza catastrophe in Bangladesh*. This tragedy immediately made me think about the working conditions and lack of opportunities in my own country, the Dominican Republic. However, it was not until a trip to Berlin with the Master in Law and Business Program during which we visited several startups that I saw that it was possible to start a company that combined all of these aspect, or actually a company at all." How did you find your business partners? "This is of course one of the biggest and most important challenges when starting a business. If you are able to convince at least one person to join you and work for free, you start to get the feeling that you are on to something real. As my first encounter with entrepreneurship was in Berlin, I figured it would be a good idea to start there. So I produced a first batch of shirts for testing and came back to Berlin with a bag full of white shirts with a red button - my minimum viable product- and a business plan to write as my master thesis. I met Guillaume Vaslin, my business partner, through a friend who knew that I was starting a company and thought we had complementary profiles. I was resilient, always talking about my project and the challenges I was facing and I was never scared that someone might steal my idea. I guess that made it easier to find a partner. When we met I pitched him the idea and he came on board as an advisor for my thesis. After two months, during which we tested our compatibility, we decided to formalize our partnership and take VIRTŪ from idea to company. One must never take a partnership lightly but starting a company by yourself is an unfeasible job. Be careful who you choose but get a partner nonetheless, two if possible." What is unique about your fair trade shirts? "Our products integrate traditional style and sustainability. During my day-to-day life as a lawyer and researcher, I realized that there wasn’t any brand that provided good-looking products produced ethically that I wanted to wear on a daily basis. At VIRTŪ we want to create garments that allow people to make a positive impact through the clothes they wear every day. Somehow allowing them to “wear” empowerment and change." Why were you as a lawyer interested in founding your own company? "I wanted to further understand the other side of the story. I feel there is an increasing need for lawyers that better understand business and entrepreneurship. How did the Master of Law and Business Program help you in this endeavor? I had never taken a business class before the Master in Law and Business. Through the program I got access to all the knowledge and contacts that made VIRTŪ possible. The classes with Profs. Ulrich Steger, Marc-Olivier Lücke, Carsten Jungmann and the mandatory internship which I completed at Mimi Hearing Technologies in Berlin played a determinant role in the creation of VIRTŪ. My main advice for all MLB students and graduates would be to stay curious! I could never have imagined that I was going to start a company when I first moved to Hamburg in 2014 and now I can’t imagine myself doing anything else." What’s the ultimate plan for VIRTŪ? "We want to develop entire communities around the production of one good, a model very much influenced by the German middle-sized companies and traineeship model. VIRTŪ is reinventing the way we produce, deliver and price our garments. We aim to make it a standard for consumers to know who produced their goods. We offer an ethical option for products and guarantee a transparent social impact with their purchase." * In 2013, a commercial building named Rana Plaza in Bangladesh collapsed, killing 1129 garment workers. Although structural damages had been detected previously causing the building to be evacuated, the garment workers were ordered to return to their work stations the morning of the collapse. 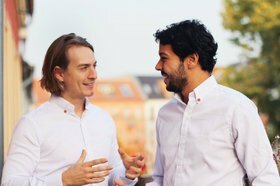 Ein Student der Universität zu Köln berichtet über den Masterstudiengang Business Administration (MSc) und CEMS Master in Management. Was hat der Master in Finance an der WHU zu bieten? Niklas Krusche hat uns im Interview getroffen und seine Erfahrungen mit uns geteilt! Ein Student an der Katholischen Universität Eichstätt-Ingolstadt berichtet über den Masterstudiengang Master of Science in Business Administration (MSc).